I’ve never met a diary I didn’t like. I can still picture my very first one–my dad bought it for me. It was fake crimson leather with gold piping, about the size of a postcard, and clamped shut with a lock and key that was completely ineffective when it came to warding off nosy siblings. Over the years I’ve kept journals for just about every corner of my life. In the throes of an obsession with my first crush I recorded the date of every interaction with him and what I was wearing. Before I digitized my calendar, I’d buy planner books that doubled as running journals and I’d draw a little “R” icon with a circle around it on every day I logged a few miles on the trail. 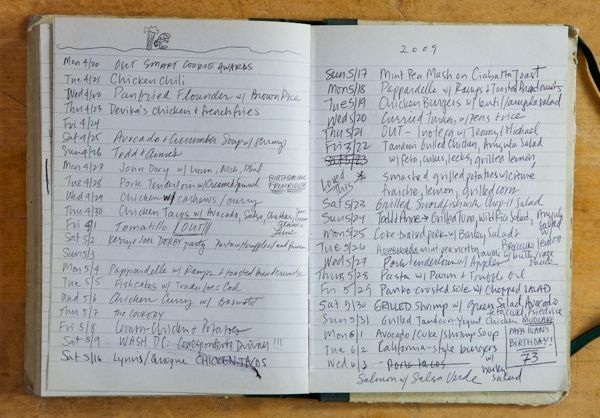 And, perhaps in my most bizarre display of obsessive journaling, every night since February 22, 1998, which was a few months after I got married, I’ve recorded what I’ve cooked or eaten for dinner in a blank book. Why? It’s a valid question. And one I’ve been asked a lot since my book, based on that dinner journal, has just been published. I think it has something to do with the fact that I’m one of those sad (perhaps deluded) people who believes that when I write things down, I have more control over my life. This strategy doesn’t always work (that first crush of mine moved on to a girl named Michelle who had a gap between her teeth and shared his fondness for Jethro Tull), but in the case of my diary, I have to say, I think I might have stumbled onto something. Initially, I started writing down what I was making for dinner because I wanted to organize myself. My husband and I loved to cook, but back then in our twenties, working long hours to prove ourselves to demanding bosses, and with no babysitter to relieve, we had a hard time figuring out how to make a home-cooked dinner happen with any kind of regularity. After a particularly grueling 5:00 p.m. back-and-forth email (What should we do for dinner? I don’t know, what do you think? I don’t know what do you feel like? I don’t know, how about you? etc. etc. ), I decided to turn things around. On Sundays, we would decide what we wanted to make, write it down in this dedicated “Dinner Diary” as it came to be known, go shopping for everything we needed, and see what happens.Fourteen years, two kids, one Boston Terrier, and 4,500 dinners later, we’re still at it. Through weeknight dinners, vacation dinners, engagement dinners, new parenthood dinners, picky eater dinners, ski house dinners, regular Tuesday-night-after-soccer-practice dinners. My diary turned into this blog, which turned into that book Dinner: A Love Story. (I will go on record to say that never in the history of cookbooks has it been so easy to pick a line-up of recipes that were destined to become keepers: I just looked at the ones that showed up month after month.) After all these years, we are more adept at improvising with what’s on hand so we no longer have to use the diary to plan for the upcoming week. Instead, I usually record what we’ve eaten after the fact, because I can’t quite break the habit, and also because taken together, all these meals tell a story that would otherwise be lost. And ultimately, that’s why I keep any diary, dinner or otherwise. Related: My Dinner Diary’s 15-Minutes of Fame in the New York Times; And, Dinner Diary, Volume 2.
just wanted to tell you that i ordered garfield (for my 14 year old son… one can never be too old for garfield :)), tin-tin for my daughter, and season one of the brady bunch(!!!!!!!!!!!! )… all for our upcoming road trip! thank you so much for the great ‘road trip’ ideas. I discovered your book yesterday as another librarian ordered it for our library, and I immediately added it to my Amazon wishlist and added this website to my Google Reader. While scrolling back through recent posts, I found this one and I just had an epiphany: I do that!!! I have been keeping a dinner diary for over 5 years now. I sit down one evening each week, and pick out meals for the week, and make my grocery list at the same time. I don’t assign days to each meal ahead of time, but it’s nice to know I have everything I need. I also make notes about the meals, such as who enjoyed it this week (I have 3 kids), and any tweaks I made to the recipe. The back of the book is saved for favorite meals, and homegrown recipes. After a couple of years of doing this, my husband suggested I also use it as a family journal, and write down notable events, milestones, and any funnies the kids have said. It is so much fun going back and looking at how much my kids have grown, and I hope my kids will enjoy reading these diaries when they are older. I just bought your book (my brother, Brian, suggested I purchase). I read from cover to cover in a day and a half and wanted to say thank you! I’ve always loved to cook for my friends and family, but after opening my own business two years ago, I haven’t been completely motivated to think of menus, hit the grocery store and come home to cook. Your book really inspired me to stop looking at cooking as a chore. One way I’ve always loved caring for my family is through our meals together and I want to make the time to continue cooking more than I have been. To kick things off, I made your recipe for Salmon Salad. We loved! So thank you again for the motivation, cozy read and know in Richmond, VA dinner is on the table.